The Petraeus team in Baghdad thinks it has six months (one Friedman unit) to show results before political pressure puts an end to its efforts. That is probably optimistic -- American moral cohesion has already fragmented and non-cooperative centers of gravity are already wrestling with each other for dominance. Further, the outlook for a game-changing outcome doesn't look good. Efforts such counter-insurgency "oil spots" (built for the rural insurgencies of the last century, read this critique of the concept) to political reconciliation cannot work in Iraq due to the dynamics currently at work in the country. Unfortunately, many of these dynamics are due to non-linear processes that provide the open source insurgency and the militias the ability to A) greatly amplify their actions and B) create chaos that overwhelms efforts at pacification/reconstruction. These non-linear processes could best be described as the centers of gravity for the opposition since they tend to confer 'success' on those groups that use them. This in turn provides the 'gravity' that makes them central to the opposition's efforts. For a further exploration of the subject of non-linear dynamics and warfare, please read Nicholls' and Tagarev's article, "What Does Chaos Theory Mean for Warfare," in the Airpower Journal. The media (both foreign and domestic). Propaganda. Recruitment/financing. Stigmergic communication for coordination. Communications systems (cell phone and Internet). Coordination. Fluidity of operations. Market-based distribution of basic supplies to citizens. Easy to disrupt. Used to undermine government legitimacy. Prone to subversion by black markets/globalization. Source of atomizing self-financing. Personal travel via highways and road infrastructure. High degrees of mobility that enable the opposition to rapidly shift operations to new locales. Disorientation. If the above systems are critical to those non-linear processes that provide the opposition the ability to effectively operate, then how can you change them such that it limits their contribution? India and Bangladesh. A 2,500 mile (~$1.2 billion dollars) fence to seal the border from what India fears could become the "new Afghanistan." US and Mexico. A 2,000 mile state of the art barrier being constructed in incremental installments. Israel and the West Bank. 436 miles of concrete barriers. Saudi Arabia and Iraq. A 550 mile wall at a cost of $600 million (part of a ring to encircle the entire country, as with the fence to the south with Yemen). Thailand and Malaysia. 75 km border fence. Pakistan and Afghanistan. A 2,400 km fence. Kuwait and Iraq. Upgrade to the 215 km fence with Iraq. Question: if the Berlin wall (et. al.) were a sign of a fundamental contradiction in the communist system that ultimately destroyed it, are these walls a sign of a similar contradiction (albeit different, given the change in directionality)? 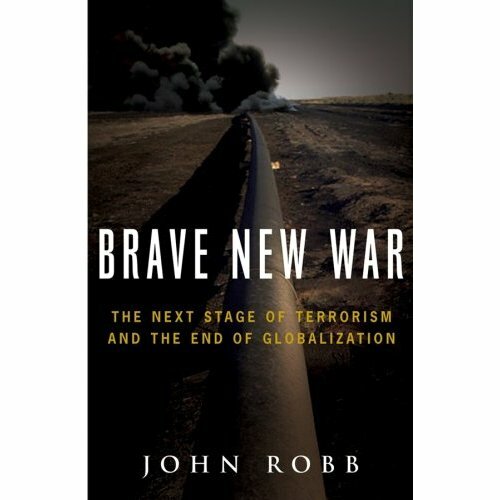 The advent of a global economic and physical superinfrastructure is in the process of transforming terrorism, guerrilla warfare, and the nation-state. A useful model for understanding this process of transformation is Philip Bobbitt’s work, “The Shield of Achilles.” Bobbitt’s work persuasively argues that the nation-state is in a difficult and dangerous process of transition to a new form of governance, called the market-state, that will be able to both withstand the pressures and thrive in a globalized environment. This process is complicated by the emergence of a vicious asymmetric competitor, in the form of a virtual state that leverages the huge flows of the global criminal economy, combined with the weakness of the nation-state during its phase transition to the market-state. This essay details the structure of this conflict and provides scenarios for its potential outcome. It's actually a fun read with articles by van Creveld, Bunker, Hazim, Manwaring, and others. Baghdad (February 21). Chlorine gas canisters exploded near a diesel-fuel station. Killing 5 and wounding 75. North of Baghdad (February 20). A tanker truck of Chlorine gas exploded. Killing 9 and wounding 148. Ramadi (January 28). A dump truck with chlorine tank blew up. Killing 16. Beyond the tactical/strategic problems that this presents in Iraq, and they are plentiful, we can be assured that any innovation that shows up in Iraq will eventually be exported to other global locales. In leaks to reporters, intelligence officers voiced concern that al Qaeda's leadership has reconstituted in Pakistan's Waziristan tribal areas. This area is now considered a temporary autonomous zone (TAZ) due to a truce that Pakistan signed with local leaders (and by extension the Taliban) last year (see "Our Man in Pakistan" for more on the details). The initial destruction of al Qaeda's hierarchical organization in Afghanistan drastically reduced the ability of the organization to design, develop, and launch global attacks. In effect, it was reduced to media messaging to catalyze organic growth of groups that would launch attacks locally. This has been relatively successful (London / Madrid / Egypt / Thailand / Pakistan / Saudi Arabia and, of course, Iraq), but it has damaged the groups ability to mount a spectacular global attack that gained it so much initial success -- in that it both incented US overreaction in Iraq and catapulted their organization into a global setting. The development of the TAZ in Waziristan and the reconstitution of a semblance of al Qaeda's previous organization means that larger attacks can and will be launched. These attacks will come in two forms, based on an analysis of al Qaeda's evolving strategy. The first type, reflects the recognition by al Qaeda that systems disruption has been extremely effective in Iraq. These attacks will likely be against the global oil system -- although rather than take the many small attacks approach used so successfully over the last three years, it will probably be focused on large events like the attempt on Abqaiq in early 2006. The second type might be another symbolic attack against the US like 9/11. With all indications that the US is in withdrawal, a new attack is likely needed to propel the US back into aggressive action (see "Al Qaeda's Grand Strategy: Superpower Baiting" for more on why). See: "Al Qaeda Chiefs Are Seen to Regain Power" Mark Mazzetti and David Rohde, The New York Times, February 18. 2007 for the original leaked information. PS>Extra credit: what happens when the "doughnut" network described in this exploration of al Qaeda's structure refills its "hole." As the open source insurgency continues to improve its methods and the US counter-insurgency effort becomes more of a police force to bolster street level security, the potential for successful assaults and overruns of small US outposts becomes a major threat. This worry, which was explored last year in briefs on this weblog, became a reality today as guerrillas mounted a triple carbomb (VBIED) and swarming attack on a US outpost 30 miles north of Baghdad in Tarmyia. The small size of the base (100 US soldiers) and its urban location (in the middle of the town) made it particularly suitable for an attack. To attack the outpost, the guerrillas used the technique used earlier in attacks on hotels/hospitals in central Baghdad. An initial attack was made with several carbombs and a third carbomb was used to kill/injure the attackers in the response force investigating the initial attack. The attack was capped with a swarming attack on the outpost from all points on the compass (read "Swarming" for more on this tactic). 2 US troops died and 17 were wounded in the attack. The only thing lacking from earlier practice was media coverage of the event (it might still end up on YouTube) and, luckily, the recently developed technique for ambushing helicopter borne responders. This will not be an isolated incident. The risk of a complete overrun exists and that risk will grow as the US continues to push forward with more aggressive counter-insurgency operations at the street level. The media term "amorphous terrorist network" doesn't provide much for us to work with. That changes when you apply advanced network theory to the topic. A recent paper by the student Mitch Stripling called, "Embodying Terror Networks: How Direction Creates Structure" (PDF) is a great example of this. The paper starts with a strongly written review of how network theory has been applied to this topic. This review starts with the early work by Arquilla and Ronfeldt (Networks and Netwars) and their simplistic chain, star, and all-channel network topographies and continues to the highly connected hubs (which embodies both the vulnerability and resilience of this type of network topology) and power-law distributions of scale-free networks (for more, read the brief: "Scale-Free (Terror) Networks" from May 2004). and various other structures (a Tube of connections between IN/OUT continents, Tendrils that feed into each continent, and islands that are clusters of affiliated but unconnected nodes). al Qaeda's leadership will increasingly ask groups to act on their own, without seeking direct connections to the central leadership. This will be accomplished through the production of global media messages that contain targeting recommendation (which is essentially a low bandwidth command link). If this works, recruits within the IN continent can transition (FLOW) quickly to the OUT continent without ever directly connecting to the central core. IF this transition can be made, al Qaeda's central leadership would become relatively immune to disruption. Nearly all of the central core could be knocked out without damaging its ability to message those groups in the operational OUT continent. In the words of Valdis Krebs, al Qaeda could look very much like a doughnut and still be able to operate. Finally, local groups that enjoy a level of operational success within the OUT continent can and will go international autonomously, in that they will create/distribute media messaging and operationally manage attacks on a global scale. Zarqawi's efforts and the recent plea by al Qaeda in Saudi Arabia for attacks on global oil infrastructure are good examples of this. Within the network model, these groups would be seen as clusters on the periphery that can catalyze the operation of the entire network (by acting not just as feeders and operators, but as mirrors of the central core). Bogart: "If you're the police, where are your badges?" Bandit (Bedoya): "Badges!? We ain't got no badges. We don't need no badges! I don't have to show you any stinking badges!!" Treasure of the Sierra Madre, 1948. Acapulco, Mexico. Drug gangs posed as federal soldiers (including the red berets of special forces) to conduct an inspection of two local police departments in Acapulco. The soldiers disarmed the policemen, transported them to a remote storage area, and then gunned them down. Many local police stations were evacuated in response to these attacks. Karbala, Iraq. In January, five US troops were abducted and then later killed by attackers posing as US soldiers complete with US vehicles, uniforms, weapons, and english-speaking drivers. As a follow-on, US troops raided a black market warehouse in Baghdad in late January that contained enough stolen US uniforms and equipment to outfit a battalion. Los Angeles, US. 789 TSA (Transportation Security Administration) uniforms and badges have been stolen from LAX since late 2002. The uniforms and badges provide wearers with wide access of airport facilities. "If anyone gets these uniforms and badges they can pretty much walk in and do what they want." Of course, this technique is as old as warfare itself. However, the complexity and speed of the current environment make it more effective than ever. In response to the loss of local control caused by globalization, many states have over centralized their control over security. These centralized efforts haven't resulted in a single hierarchy, but rather a plethora of overlapping and often conflicting efforts that routinely trump local authority (an example of how complexification in response to environmental challenges are now providing negative returns on investment). Real-time verification is nearly impossible given the remoteness, obscurity and opacity of these parallel "authorities." As someone who has used this technique on numerous occasions in the real world, I can vouch that it works exceedingly well for exactly the reasons I list above -- even more so if you count the benefits of public fear and inter-organizational distrust that guerrillas generate by using this tactic. “Once the legal monopoly of armed force, long claimed by the state, is wrested out of its hands, existing distinctions between war and crime will break down much as is already the case today in . . . Lebanon, Sri Lanka, El Salvador, Peru, or Colombia.” Martin van Creveld. States may not have an option. The catch is that if the national government doesn't/can't step in to rectify a decline in local control, forms of organic security, exemplified by the AUC in Colombia and the militias/paramilitaries in Brazil's favelas (of which these groups now control 92 out of 600) will replace them. JOURNAL: A Stinger Moment (via YouTube)? In 1983, the US began to smuggle large number of the Stinger surface-to-air missiles into Afghanistan (as well as a mix of other weapons and tactics), in order to provide the mujaheddin a way to tackle the USSR's Hind-D helicopter. The result was spectacular. The Soviet's lost 333 Hinds. News that a sixth US helicopter was shot down today (the count includes a mix of models including the Blackhawk, a Boeing little bird, a Marine Sea Knight, and the Apache) may indicate a similar line has been crossed. It was likely inevitable, given the growing alignment between regional states with the non-state groups in Iraq (or even worse, the groups have generated sufficient funds/connections from black globalization to bypass states), that high-end weapons would begin to show up. With more effective SAMs in play in combination with barrage tactics (that leverage learning about US evasion tactics), US weapons helicopters are vulnerable like never before in this war. Besides an increase in casualties, these weapons radically increase the range of tactics available to the guerrillas and may result in a rapid innovation cycle similar to what the US faces in IEDs. Are advanced ATGWs and associated tactics next? The discovery/destruction of the madhist cult outside Najaf is more proof that, in the words of Richard Feynman, "there's plenty of room at the bottom" when it comes to primary loyalties. A primary loyalty is a connection to a non-state group that is greater than loyalty to a state. These loyalties include those to clan, religion, tribe, neighborhood gang, etc. Look to globalization to accelerate/catalyze this race to the bottom.